The King of Marathons Runs the Kings Highway! Dean Karnazes promotes 50/50: Secrets I Learned Running 50 Marathons in 50 Days -- And How You Too Can Achieve Super Endurance. Dean Karnazes, Ultramarathon Man: Confessions of an All-Night Runner. 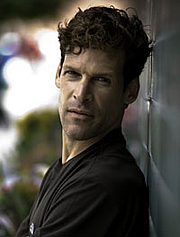 Dean Karnazes is currently considered a "single author." If one or more works are by a distinct, homonymous authors, go ahead and split the author. Dean Karnazes is composed of 2 names. You can examine and separate out names.